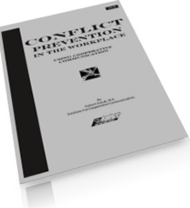 Are you a conflict starter at work? The first step in identifying what you might want to change is to become more aware of what you do now, then target certain communication approaches, and learn how to replace the older, less effective ways. 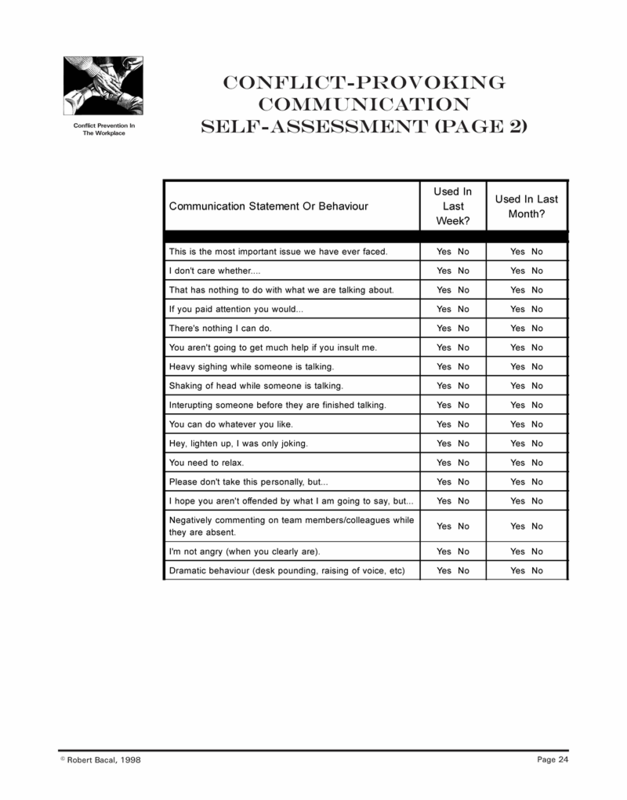 On the following page you will find a brief self-assessment instrument to help you think about and reflect upon how you communicate. Since the purpose is to stimulate your thinking about yourself, the instrument isn’t meant to provide a scientific diagnosis of how you communicate. It’s only for you, and doesn’t compare you to anyone else or a standard of behaviour. The instrument is composed of three columns. 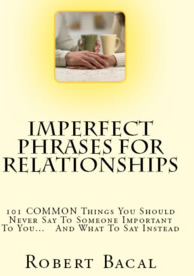 The first contains examples of communication statements or methods. The second asks you if you have used that particular statement, or a similar one, during the past week (yes or no). The third column asks you if you have used the particular statement, or a similar one, during the last month (again, yes or no). You needn’t have used the EXACT phrase to check off the yes option. If you have used something close to the particular phrase in intent, tone, or wording, then choose YES. After you have completed the instrument read the section following it for an explanation. 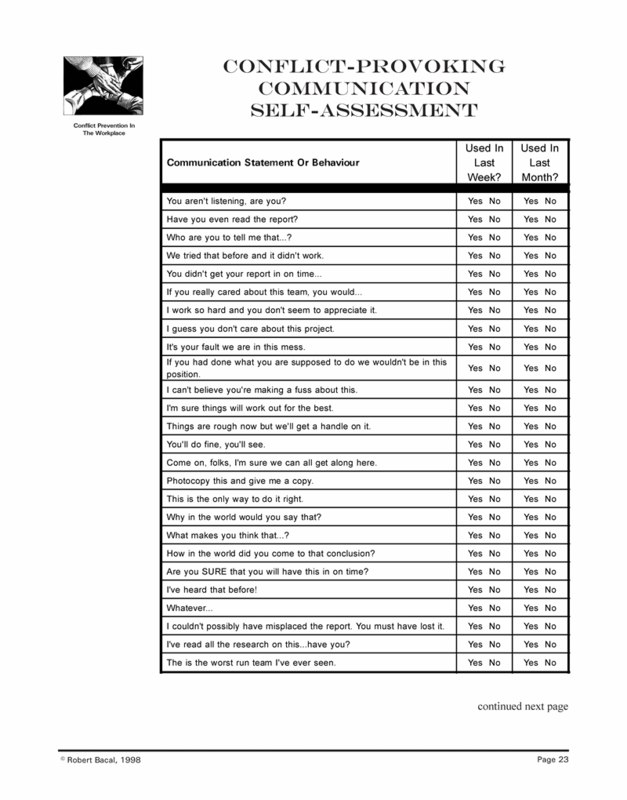 If you are like most people, you have used some, if not most of the statements and behaviours listed in the self-assessment. 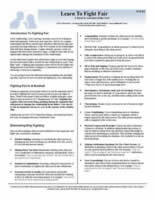 It may or may not be mmediately obvious to you that all of these statements or behaviours can contribute to generating unnecessary conflict in the workplace. use them in is important. However, if you habitually use a number of the techniques or phrases, it is fairly likely that you are creating conflict trouble for yourself, and those around you. Don’t be concerned if you use some of the behaviours/statements, and use them infrequently. We all do. Regardless of how often you use conflict-generating language, you will find that you can always improve by replacing them with more cooperative ways of expressing yourself. If it isn’t clear to you why any of the items on the list could be problematic, we will explain them and the problems they can cause later in the book. For now, you might want to note that you DO use these kinds of statements, as most of us do. And like most of us, you probably contribute to generating conflict situations, unintentionally through the use of conflict-provoking language or behaviour.